Upon the release of Beyondless, Iceage’s output has increased to four albums in under seven years. That they’re still furiously innovating is impressive, and they show no signs of letting up at any point of their latest effort. That said, Beyondless is a polarizing love-it-or-loathe-it record that never quite feels like it’s done enough to warrant more than a couple of spins. With a noisy decade of material under their collective belts, the punkish Copenhagen quartet reach experimental ground on their new album. However, it’s a tough ask to get through in one sitting, and if you like your singing cultured, melodious – and… well, on key – Iceage is not the band for you. Even for listeners with punk credentials safety pinned to their leather jackets, Elias Rønnenfelt’s voice can be a little grating. If you’re anything approaching precious about a singer having the perfect voice, the fact that Rønnenfelt spills over every surface of the album will have you tearing your hair out. Like it or not, Elias Rønnenfelt is the focal point of Beyondless, and barely ten seconds go by without his tuneless, drawling Julian Casablancas approximation present. His is an affected style of delivery that can be a distraction at times from Iceage’s often creative arrangements. Catch It is one of Beyondless’ more mould-breaking tracks, a pulsing post-punk desert session stomp. It winds up like a muscle car chase movie scene, sounding like latter day Spoon heard through a detuned radio. The listener is coiled in with a marching drum track, before an enigmatic chorus crystallises with keyboard strikes. Raising and lowering its tempo with a scorching wah-wah guitar outro and then freezing back in place for its finale, every second of Catch It is never anything less than thrilling. When it all comes together for Iceage, the results are excellent, like on the Sky Ferreira collab Pain Killer. It’s an unexpected follow-up to strong opener Hurrah, itself a tornado of guitar gales, handclaps, and an insistent chorus of “we can’t stop killing and we won’t stop killing”. Pain Killer meanwhile bursts forth with horns and clattering guitars, while Ferreira alternates between coos and wails beneath Rønnenfelt’s nasal snarl. Beyondless finds its sweet spot mid-album with the couplet of Plead the Fifth followed by Catch It. Plead the Fifth features psychedelic guitars and almost music box-like sounds scouting ahead of its catchy yet threatening basslines. By the time the album’s second half rolls around, Rønnenfelt is front and centre in the mix. Thieves Like Us and Take It All prove a breaking point, despite the former’s wry and verbose lyrics and the latter’s spaghetti western atmosphere. If you haven’t tired of his voice by then, you’re doing pretty well. The album does harbour some hidden gems like Showtime, pitched somewhere between 50’s noir and American gothic, or Blackstar era David Bowie with a Jimmy Page guitar riff. Rønnenfelt pillaries critical response to a magnetic musical personality, “Is this some sort of sick joke, played on well paying folks? What a selfish life” he sings over what turns into a pure vaudeville ending. 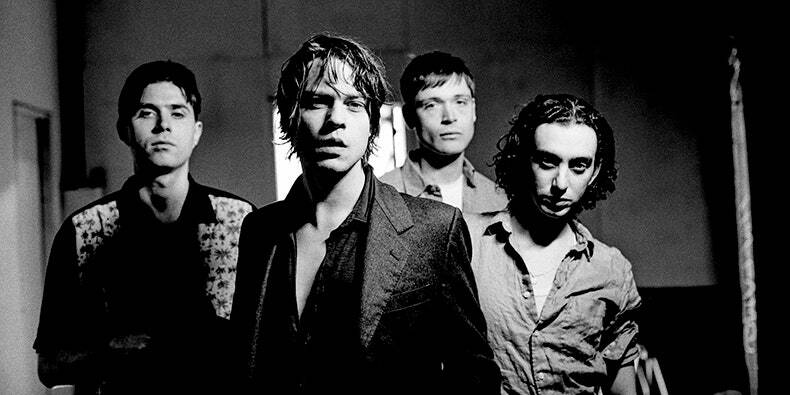 Overall, unless you’re a fully paid-up Iceage fan, it’s not an album you’ll be rushing back to in a hurry. Although Beyondless’ best moments are strong, it never quite escapes from the gravitational pull of its low points.